Let’s be honest, doing new things is scary and the temptation to avoid trying something unfamiliar is strong. To counter that temptation, I give you the words of Pablo Picasso, "I am always doing that which I cannot do, in order that I may learn how to do it." The quest for continuous improvement frequently requires leaders to try things that they don’t yet know how to do so that they can learn how to do it. For many, Gemba walks fall into this category. If you’ve never done one before, even if you’ve never heard of one before, this blog is for you. What The Heck is a Gemba Walk? Taiichi Ohno, a Toyota executive, is often credited with the development of the concept of the Gemba walk. A Gemba walk is a practice in which company leaders, managers, and supervisors physically visit the place where work is done to gather information and feedback, and to observe processes first hand. The ultimate goal is to identify opportunities for improvement. Changes are not made “on the fly” during the visit, they are only implemented after a period of reflection and analysis. There is often a delta between how processes look on paper and how they are executed in real life. In some cases, the documentation needs to be addressed, in others the work process needs to be brought in line with the standard work. Direct observation is often the best way to tell the difference. Visiting the workspace is an effective way to communicate both the value of the work being done and the importance of continuous improvement. Employees see that leaders are interested in what is happening in their corner of the organization. People are often more open to providing feedback and explaining the reasons for their behavior when they are in their own space, not out of their element in an uncomfortable board room. It is easier for them to describe exactly what they do and to demonstrate why. Opportunities for improvement are about workspace and process issues, not people. Being present in the space is the best way to spot these opportunities. Front line workers may be so used to process or workspace problems that they no longer recognize them as problems. A fresh set of eyes is extremely valuable. Gemba walks are not without risks. If not properly executed they can actually reduce employee engagement and result in fixes that don’t address the root causes of problems. Gemba walks must not be seen as punitive or personal. Employees should understand that the purpose is to make them more efficient and produce a higher quality product by addressing problems which are almost always process or environment related, not the fault of failing employees. Process improvements should not be made during the Gemba walk. Before an improvement is implemented, a PDSA cycle or the use of the 5 Whys is necessary to determine the real cause of problems and the expected result of improvement. Gemba walks should not be limited to one particular time of day, day of the week or time of year. In order to truly understand the flow of work, it is necessary to observe at different times and with different teams performing the work. 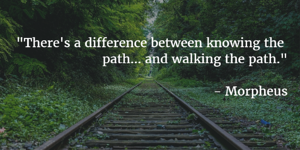 We don’t get to quote “The Matrix” very often in this blog, but at one point in the film Morpheus says to Neo, "There's a difference between knowing the path... and walking the path." I don’t think he was talking about Gemba walks, but he captured the spirit exactly. To understand your staff and help them eliminate waste and improve the flow of value to your customer, go pay them a visit.